One of the most easily assessed and spectacular field trips in the country isn’t too far from here. 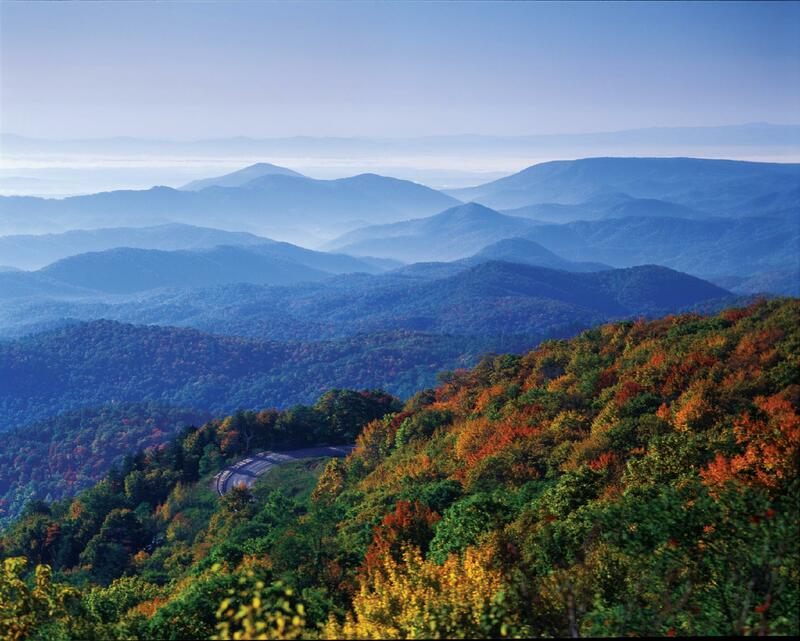 The Blue Ridge Parkway, America’s longest National Park, meanders from Virginia to North Carolina, a distance of almost 500 miles. The pre-start of the ride begins in Front Royal, Virginia and is named the “Skyline Drive” down as far as the Waynesboro area, 109 miles where it turns into the BRP from then on. The Skyline Drive isn’t all that great but it’s the most direct lead-in to the BRP so it’s just as well you start there. The “real” BRP connects Shenandoah National Park with Great Smoky Mountains National Park. It begins at Rockfish Gap near Waynesboro. You can easily do the entire length of the BRP and get home in about a week. It usually takes three days to traverse the entire length because you can’t go very fast. There are several lodges actually on the BRP road and they are about equidistant from each other and you can easily get off and back on for food and lodging along the entire route. By history, the construction of the BRP began as part of Franklin D. Roosevelt’s “New Deal”. Work began in 1935. The Works Progress Administration, the Emergency Relief Administration and Civilian Conservation Corps camps performed most of the work. During World War II, conscientious objectors were pressed into this construction. The parkway took over 52 years to complete, the last portion opening in 1987. 2015 marks the 150th year anniversary of the last Civil War shot fired east of the Mississippi near present-day Waynesville, NC. The BRP is considered by many to be the gold standard of American touring trips. Many bikers and sports car clubs congregate to run all or part of the BRP. Most of the road consists of what bikers like to call “twisties”, tight corners and switchbacks in heavily forested areas with very little if any traffic. The elevation also varies dramatically from lower areas to over 6000 feet, changing the weather patterns from warm to downright chilly. The BRP is amenable for family sedans and SUVs, but of course not nearly as enjoyable as in a small open-air vehicle. The traditional pinnacle of bikers’ rides, further west where Tennessee meets North Carolina is the “Tail of the Dragon”, an 11-mile stretch of US 129, an incredibly twisty road sporting 318 tight hairpin corners. However, the Tail has become overcrowded, especially with novices riding it much too fast and getting hurt pretty regularly. If you follow the BRP on the map down to it’s near end where it makes a right turn toward Cherokee land, you’ll see a little town called Waynesville, NC. In that area, the crème de la crème of spectacular and sometimes challenging tours occur. Rides in this area are named and mostly bikers come from all over the world to access them. The “Moonshiner 28”, “Devils Triangle”, “Diamondback 226”, “Six Gap North Georgia”, “The Rattler” and the “Copperhead” to name a few. These roads were built long before Interstates and surveyors were forced to build them around the mountainous conditions with many twists and turns around obstacles. There is virtually no traffic on any of them anymore except sports car clubs and bikers. I’ve been riding these areas for over ten years and I know all of it by heart. Last week was a time slot with nothing much to do and the weather was good so I decided to do it all again. I also decided to just ride down there on my venerable BMW R1150GS, the Rock of Gibraltar on two wheels, because having to deal with a trailer on several motel overnights would be a time wasting problem. From my house to Waynesville, NC is about 560 miles. This is the area of all the fabulous rides so I decided to forego doing the entire BRP again as I’ve done it stem to stern in the past and didn’t have the time this trip. So I rode the Interstates to the area of interest and did it all in four days. I did do parts of the BRP in North Carolina this trip. On the return trip, I was weary of motels and so decided to ride it straight, 560 miles in about 11 hours. I wasn’t sure I could do it and so had the option of stopping along the Interstate anytime, but I did OK. This entry was posted in Hombres MC rides, Places visited- USA. Bookmark the permalink.